Hi Phillip- this sounds very interesting to me. Although I'm not a ship modeler per se (my main interests are 1/72 aircraft and 1/35 armor), my general interests are all over the board. This captures my attention for four main reasons: it's from the Great War, it's a Great War submarine, it's vacuum-formed, and it's 1/72. I enjoy scratchbuilding and modifying kit parts from standard injection-molded kits, but I've yet to attempt anything this intensive and I'm very much looking forward to watching how you progress on this. Maybe - just maybe - the centennial observances will see a surge of new WWI kits. Airfix already has a series of older kits with new packages on its website, and Tamiya's 1/35 British tank, with a set of infantrymen to accompany it, is due next month. It could easily be argued that the U-boats of WWI were, in the context of world affairs, among the most important naval vessels in history. I'm not inclined to tackle a 1/72 vacform, but I'd love to see a plastic kit in 1/144 - or, for that matter, 1/350. I was doing a forum search to check on U Boat builds as I wondered what U Boat kits were available and am very surprised that a WWI kit is offered. Does that mean vac form models are hard or? Vacu-formed models require a different mindset than many modelers who assemble mass-market kits have. You will need to come up with formers, strengtheners, and stiffeners to give the model some strength and stability. Plenty of filling, sanding, scribing, prime and repeat. Vacu-formed kits are more of an 'enhanced' scratchbuild. Oh! LOL prolly way outta my league! Yes I know of combat models kits.I used the fuselage of their 1/48 He-177 for my JU 287 project and they do require a lot of work but can be made into nice models if you take your time.I will be watching this build log closely as I have a feeling it should be an interesting project! Gentlemen-This is the kind of discussion I was hoping for. philo426-Your plane looks nice. I know that was a lot of work. Spru-ce Goose-You are welcome. I went to RevellAG's website site and voted for the WW1 1/72 U-35, but it was VERY low in the vote count, confirming there is just not a lot of interest. The overall length of the U-9 in 1/72 scale is about 31.375" (not too long). jtilley-I agree with you on the WW1 subjects. I believe the WW1 German U-boats came closer to beating Britain than they did in WWII, but there is just not that much information available on them. Stage_Left-I am still trying to talk myself into making this my next project. If I do (and I post a progress build) maybe that will be enough to get you to take the plunge. EdGrune-Yeah, you have to really like the subject matter to build a vacuform. .It offers a way to " get it right " instead of resin or injection models. which for the most part are incorrect to start with . Spru-ce Goose-You are welcome. I went to RevellAG's website site and voted for the WW1 1/72 U-35, but it was VERY low in the vote count, confirming there is just not a lot of interest. Just checked again.........Someone wants a 1/72 U Boat................ . According to my sources U-9 had one machine gun. In 1915 all surviving boats in the class (exept U-21 and U-22 ) were fitted with one Tk 5cm/40 gun. U-9 gun was removed when she was converted to a minelaying boat (march to december 1916) She carried 12 P or Tk mines in two rails with semi-circular cross-sections. These ran along both sides of the upper deck and met at the stern about 4 m forward of the mine launching posistion aft. As a minelayer she needed extra buoyancy in the Baltic (weight unknown) and needed 1.5 tonnes reserve buoyancy in the north sea. Trials with net-cutting equipment were also carried out on this boat in 1917. I will follow this build with great interest !!!! WOW! someone actually attempted to produce the U-9 with what little there is to find on it! I have been searching (of and on) for information on this sub for the last few years seeing if maybe something new may pop-up but really haven't found anything. i did find a book with a really decent (well, the best i have found out there so far) 2 page spread of the sub. i thought i had the book here next to me in my pile of books, but it looks like it may be downstairs and will try to look for it tomorrow. i don't recall the book itself, but it was one of about 8 books this company produced, one was on subs, another one was on old warships, another on planes and so on. the booklets were 8.5" x 11" and were about 50-75 pages. History at War? if i find it i'll post what book it is. the drawings also show the water level wrong as it doesn't sit that far out of the water, the main hull just barely sits above the water as you can see from all of your photos. you may wish to expand your search to include her sister ships. they might not be exactly like the U-9 in all aspects but they may shed some light in areas where they are. i will say it looks like you have 3 pictures i don't, the first and the last 2, but the last 2 look familiar. On my computer I get all " Photo not Found " with a little kitty in the background . T.B. 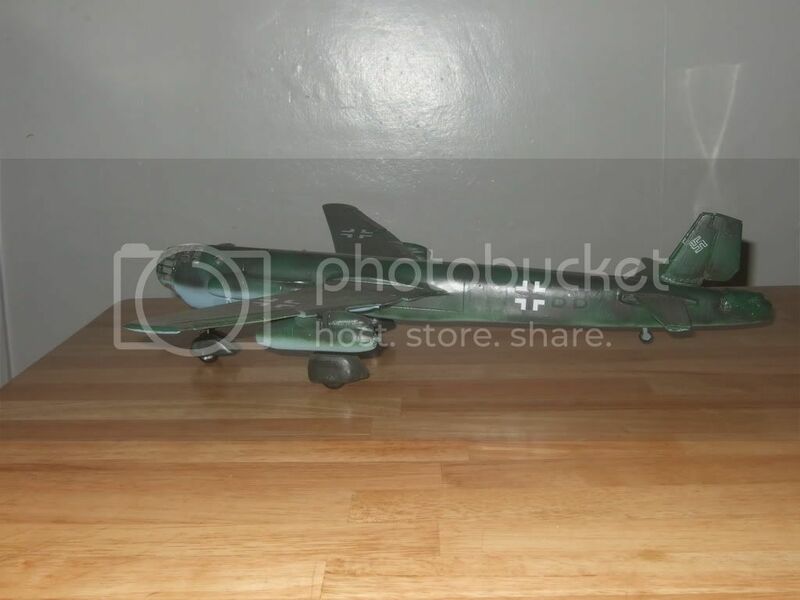 I removed photos of the Combat Models' U-9 submarine due to limited space on my Photobucket account. I sold the model on Ebay and then deleted all photos I had from my computer. The more I researched U-9, the more I realized what Combat Models provided was not only crude but incorrect. My advice is run as fast as you can. I think you will understand once you get the kit. I do not mean to come across as a "Debbie Downer" because I consider my self a positive modeler, and try to cut some slack to every manufacturer. I will say I am a huge fan of early WW1 German U-boats, and if anyone ever releases an injection kit in a large scale (72 or larger) I will be the first to jump in the pool. Sorry I could not provide any help (or inspiration) here. Good Luck!